Wow. This isnt bad but damn silence haha. Still its helpful. is this a cornered sentry synergy ? Pretty good if you're playing it for 3 mana or less. Could be a nice tool for evolve shaman. Being able to put a bunch of minions on the board for cheap and with the new zentimo + unstabble evolution combo. Second-Rate Bruiser was used in MSoG, but only because there weren't any better defensive cards. He got replaced by Tar Creeper (and Stonehill Defender). For now I am calling it bad. 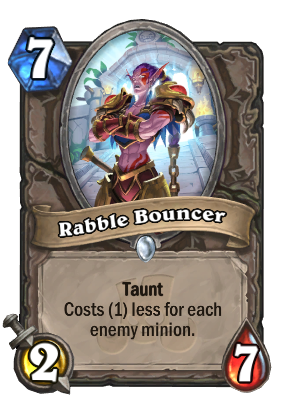 Second-rate Bruiser was only fringe playable and it was a much better card than this. Tar Creeper is so much better than this garbage. Even against Odd Paladin, this card will, at best, block 3 leveled up recruits while Tar Creeper will trade kill 2 and be better in other matchups. Second-Rate Bruiser was run early in Mean Streets, but fell off pretty quickly. Moreover, we have far better defensive tools now than we did then. I'm just not seeing this working out. Beautiful against zoo, once Tar Creeper rotates out. Like. Will be interesting in a meta where we could see a lot of void rippers teching against spirits.